Ever since I was a kid, I would always be excited to eat breakfast (not that I’m not ever excited to eat…just extra excited) when I would see a brown paper bag containing warm, soft pandesal on our dining table. Pandesal (Spanish pan de sal or “salt bread”) is not really salty at all (at least in the Philippines) and is a breakfast staple in many Filipino households. I love pandesal! This morning I started feeling like a kid again when I saw pandesal in our table. When I got back up to my room to have my quiet time, I began thinking about how I can make our pandesal extra special today because it was a bit stale. Also, I felt like cooking and inventing–and with a lot of pandesal and eggs (another breakfast staple and personal favorite) and CHEESE available from our cupboards, who wouldn’t wanna whip up something extra special?! Beat the eggs in a bowl with a fork. Add in 2-3 pinches of salt, white pepper, cheddar cheese, and milk. All the recipes I found before stated that the amount of milk (in teaspoons) should be the same as the number of eggs you use. This time I want my eggs to be fluffy & creamy, so I added more milk. Whisk some more until the ingredients are thoroughly mixed. In a steel pan, put the 3 tbsp of oil (or butter) and heat enough before placing the eggs. Pour the egg batter to pan and after 10 seconds, do the Martha Stewart technique to achieve the creamy scrambled eggs texture: with your spatula, push the outer edges of the egg mixture to the center. Keep doing this until the eggs set and there are no more runny parts in the egg. This takes about 30 seconds. Add 2 more pinches of salt. Turn off the heat and transfer to a bowl. Set aside. Pour the remaining oil (or butter) over the pan and heat (or melt). When warm enough, place the garlic and fry until they are golden brown and really crispy. Just don’t burn them! Transfer to a bowl and set aside. 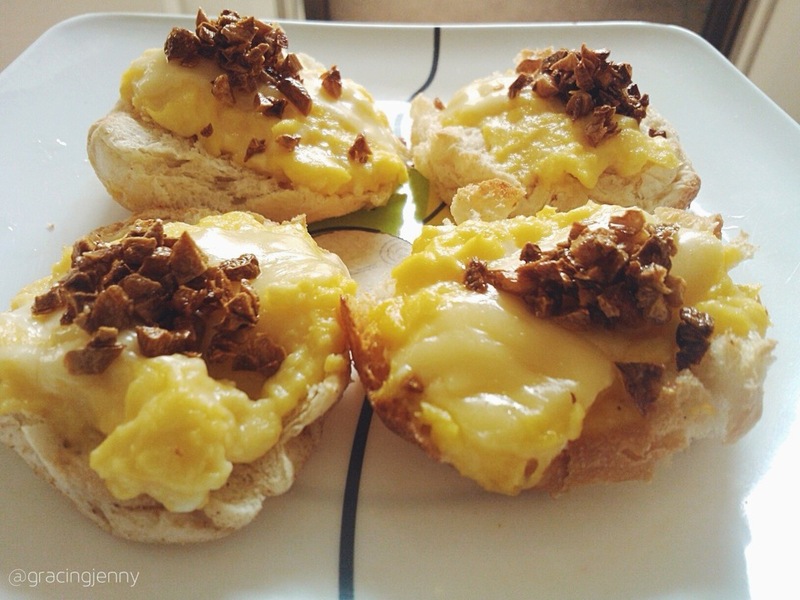 Top each pandesal with about a spoonful of eggs (depends on how big or small your pandesal is. Make sure the top is filled, but not overflowing). Place the slice of Quickmelt cheese on top of the eggs. Toast the bread for 1 minute & 30 seconds, or until cheese melts (since it’s quickmelt, 1.5 minutes works mighty fine). After toasting, place a teaspoon of the garlic chips on top of the egg & cheese. Garnish with parsley flakes. Serve warm and with the biggest, ear-to-ear smile on your face!! 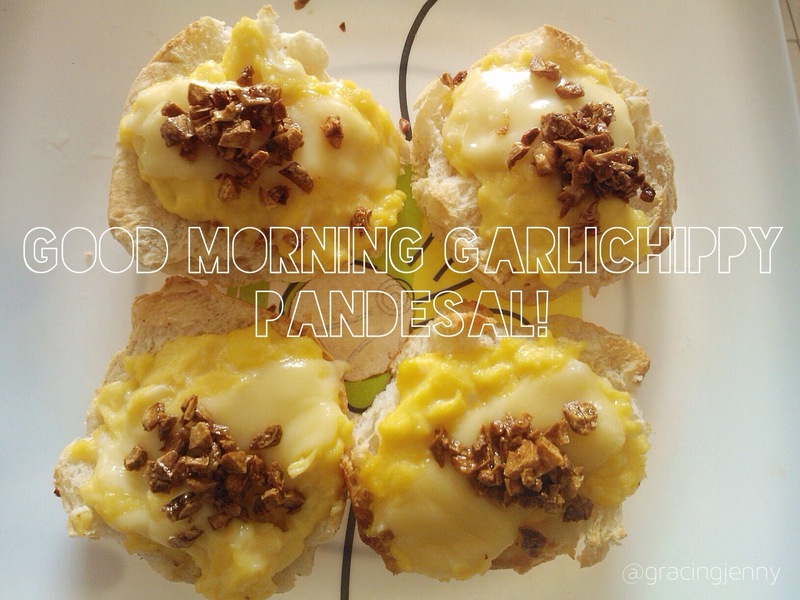 Author Jenny J. TalamPosted on 5 January 2014 Categories Food & ExerciseTags 2014, breakfast, eggs, garlic, pandesal, recipesLeave a comment on Good Morning Garlichippy Pandesal!